We have great news to share. Today we are releasing a third release candidate build which is now available to download. With this release we have updated the version number to 2.0. 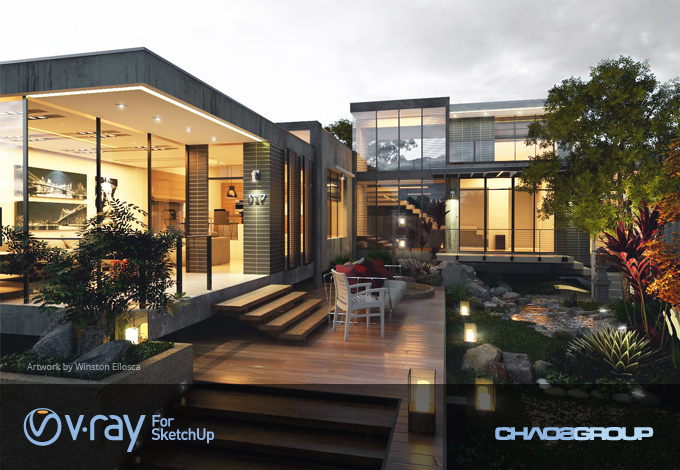 The official release of V-Ray 2.0 for SketchUp is only a few weeks away. • Resolved an issue that caused geometry to vanish when editing a scene during a V-Ray RT render. • Transitioning between perspective and parallel cameras while rendering with V-Ray RT no longer causes the rendered view to get stuck in parallel mode. • When V-Ray RT in OpenCL mode fails to setup on OSX, V-Ray will revert to CPU mode without a crash. • Resolved crash in RT CPU when VRayBRDF has both fog and translucency turned on. • Improved stability of RT GPU. • Skp2Sided material now supported with RT GPU. • Opacity and other float textures render properly in RT GPU. • The standard material pays attention to the Default Displacement override / Use global parameters. • Our Standard, Skp2Sided, Toon, and Angle blend materials check and correct invalid (negative or infinite) colors. • The VFB stays on the top of the SketchUp window in OSX. • RGB/Alpha channels are always the first two channels in the VFB and are above other custom render channels. • The VRayBRDF layer gets used for viewport representation in our LayeredBRDF. • V-Ray diffuse color is no longer incorrectly overwritten by SketchUp material color in some cases. • Resolved an issue that caused light cache retracement to always be off regardless of the checkbox in our UI. • Resolved problem that could cause default options to be loaded instead of the serialized scene options if you open a model by double-clicking on it rather than doing File->Open. • Our Options Editor no longer becomes empty when trying to use render presets. • Resolved an issue where DR Nodes could intermittently stop contributing. This fix is part of the spawner itself, so you must reinstall it. • Resolved “Ghost windows” from happening on OSX. • Materials ending in the number "0" now load properly. • Resolved an issue that would prevent copy and pasting objects between models, or automatically undoing the last operation while copy and pasting between models. • Unicode paths are now supported when referenced from within lights - IES file paths, for example. • The physical camera matches viewport FOV. • Focus distance is set correctly and DOF render properly with the physical camera. • Resolved issue that caused VRayBRDF to be unresponsive to changes made in SketchUp material editor. • Materials no longer rename themselves after making edits in the SketchUp material editor. We would like to encourage you to continue testing and reporting bugs with the new V-Ray for SketchUp release candidate build. Send your bug reports to vfswip@chaosgroup.com. We are looking for great images for our gallery and tutorials for our newsletter! You may send the materials to pr@chaosgroup.com. Thanks for being part of the V-Ray experience! Copyright © 2015, Chaos Group. All rights reserved.